In the second pAsuram, parAnguSa nAyaki‘s friends et al say “should you be anxious? should you not sustain yourself by holding your heart tight?” and she replies “my heart which became immersed in the divine lips of the emperumAn who is mercifully residing in thenthiruppEreyil, is not under my control”. Subsequently, parAnguSa nAyaki says to her friends, mothers and neighbours “I am unable to control my heart which became attached to emperumAn who has infinite supremacy, simplicity etc”. nAnak karunguzhal thOzhimIrgAL! annaiyargAL! ayaRchEriyIrgAL! annaiyargAL – oh mothers (who control them and me)! ayaR chEriyIrgAL – oh neighbours (who have arrived to enquire about the situation)! Oh friends who have black, fragrant hair due to application of fragrant materials! Oh mothers! Oh neighbours! I am unable to stop this independent heart of mine; it is not obedient to me; night and day, it is leaving me and is becoming attached to the reddish fruit like beautiful lips of krishNa who is having a radiant gemstone like form, who is the resident of paramapadham with supremacy, and is now residing, manifesting his greatness, in the fortified thenthiruppEreyil, which is surrounded by cool water bodies and is having flower gardens which are swarmed by beetles. nAnak karum kuzhal thOzhimIrgAL – nAnam – nice fragrance. She is highlighting it as a blame for them. As they are with the best fragrance, she is unable to bear it like a deer which will die if a hair falls off it [in separation, she cannot just bear her own decorations, she cannot even bear others’ decorations]. Would I not stay here itself, if you were not here [decorating yourself like this]? Their hair reminds her of emperumAn‘s dark hair. Should the friends not be in the same state like her as said in SrI rAmAyaNam kishkinthA kANdam 5.18 “Ekam dhu:kham sukham cha nau“ (sharing sorrow and joy)? While she is not even caring for her hair and will perish if she sees the fragrance, can her friends use fragrances? As he engages with her in union, whatever flowers etc they discard, are given fully by her to her friends only. Since it was his merciful gift, even if those flowers become dry, they will continue to keep them in their hair! That reminds her of him and tortures her. Alternative explanation – they do use fragrances too. That is, they decorate themselves since if they remain morose without decoration, that will cause more anxiety to her. They will work to uplift her mood even at the cost of ignoring their own suffering [of decorating in such situations]. While bhagavAn who is indicated by “a” in praNavam and AthmA who is indicated by “ma” in praNavam are both present since time immemorial, the AthmA was not uplifted. Now, the act of uniting them is that which uplifts him; in this manner, they need to convince her to uplift her. They will not bother about their own suffering, they remain “we should bring glory for the lord”; this is similar to iLaiya perumAL (lakshmaNa) who is more anguished than perumAL (SrI rAma) [during separation from sIthAp pirAtti], would sustain himself with care for the protection of perumAL. iLaiya perumAL is said to be parama bhOgi [great enjoyer, great serpent]. SrI rAmAyaNam kishkindhA kANdam 1.60 “saumithrE paSya pampAyA:” (Oh lakshmaNa! See this pampA river banks) – though he could see the enjoyability there, he turned away from the scenery to distract perumAL; [so perumAL says] brother! look at this. nAnak karum kuzhal – A thamizh scholar said “since nAnam is an adjective for kuzhal, this means hair which appears like nAvi (musk, civet scent)”. This also implies fragrance only. thOzhimIrgAL – Those who speak priyam (favourable sweet words) have gone to the group of those [mothers] who speak hitham (advice)! thOzhimIrgAL! annaiyargAL! ayaRchEriyIrgAL! – The three stages are highlighted here – a) I know some secret and not even share it with the friends b) the friends and I know of it and the mothers don’t know about it and c) friends, mothers and I know but others don’t know; crossing all these stages, things have become so public that, she is calling for everyone. She need not tell anyone; this being the case, she is so anguished that even the enemies will pity her state. SrI rAmAyaNam sundhara kANdam 21.18 “mAm samAnaya dhu:khithAm” (unite me who is suffering, with SrI rAma) – sIthAp pirAtti tells rAvaNa to unite her with SrI rAma. As said in SrI rAmAyaNam sundhara kANdam “thadhAkuru dhayAm mayi” (show mercy to me), sundhara kANdam 39.10 “vAchA dharmam avApnuhi” (become righteous through your speech), she is speaking the words that should be spoken to thiruvadi (hanuman) et al, to the one who separated her from SrI rAma. thOzhimIrgAL … – [Being my friends] How you liked what I liked! How you looked out for my priyam and hitham! How you remain indifferent towards me! nAn iththani nenjam kAkka mAttEn – Do you have any reason like I do, to cross your limits? nAn – Did you lose your heart [to any one]? Implies her situation is not the same as theirs. ith thani nenjam – Just as I have become distinguished from you, my heart has become distinguished from me. thani nenjam – Independent heart which does not obey me. Even the heart of sIthAp pirAtti who is said to be SrI rAmAyaNam sundhara kANdam 39.40 “thath thasya sadhruSam bhavEth” (it will be fitting if SrI rAma could come on his own and take me) is not a match for her heart. kAkka mAttEn – (I don’t have the ability to protect myself) She can only say as in periya thiruvandhAdhi 1 “mundhuRRa nenjE iyaRRuvAy emmodu nI kUdi” (Oh heart which is rushing towards perumAL before me! wait, let us pray together), and cannot stop it. It left me without seeing anyone else as said in SrIvishNu purANam 5.18.22 “kurava:kim karishyanthi dhagdhAnAm virahAgninA” (what would the elders do to us. I am burnt by this fire of separation); it is not returning after hearing something from him; from “mAttEn“, it appears that she tried to stop the heart, but it went without listening and she gave up. Just as samsAris (materialistic people) won’t withdraw themselves from worldly pleasures derived from Sabdha (sound) etc, AzhwAr will not withdraw himself from bhagavath vishayam. en vasam anRu idhu – What shall I do if it ends up separating the child from the mother? Only when SrI bharathAzhwAn listens to kaikEyi’s words and rules the kingdom, she will listen to her mother’s words and withdraw herself. Am I am not your daughter now? My heart too is like me. Instead of being present for my sake, it made me follow it. irAp pagal pOy – I am not seeing any moment when I can advice it, in the available time; her attachment is unlike [that of materialistic people] where one is sometimes attached to bhagavath vishayam and other times to worldly pursuits. Only if it is here for a moment, we can advice it. thEn moyththa … – Did it get captivated in a matter from which it can be withdrawn? Can we withdraw those who are captivated by the enjoyability of the town itself? thEn indicates beetle. pUm pozhil … – In thenthiruppEreyil which has blossomed gardens and water bodies. vIRRirundha – Manifesting his seated posture of paramapadham, as it is, in here. Is this town like that paramapadham? This place is such that, one person’s clothes will be worn by many [such inferior abode]; this abode is the place from where both the paramapadham and samsAram are perfected. vAnap pirAn – This implies the faultless supremacy. 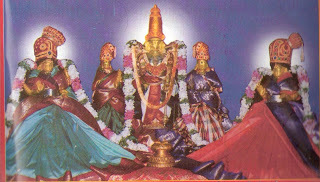 thenthiruppEreyil vIRRirundha vAnap pirAn – The benefactor who manifested the posture of SrIvaikuNtam in this abode. maNi vaNNan – The beautiful form which will make us hold him tight, even if he lacks the supremacy. kaNNan – One who lets the residents of this samsAram to enjoy the form which is enjoyed by the residents of paramapadham. vAnap pirAn … – Is it possible to measure the supremacy, beauty or simplicity? sem kani vAyin thiRaththaduvE – Just as one will get caught in the swirl during floods, she got caught in his lips; wouldn’t one return only when the boundary of the desired matter is found? It got captivated in the reddish, fruit like lips; only when it returns to me, can I listen to your advice. This entry was posted in thiruvAimozhi, thiruvAimozhi 7th centum on August 10, 2018 by Sarathy Thothathri.